The National Association of Active Investment Managers released its weekly sentiment survey of money managers. This week total equity exposure among respondents declined a bit to 62.47%, from 66.67% previously. 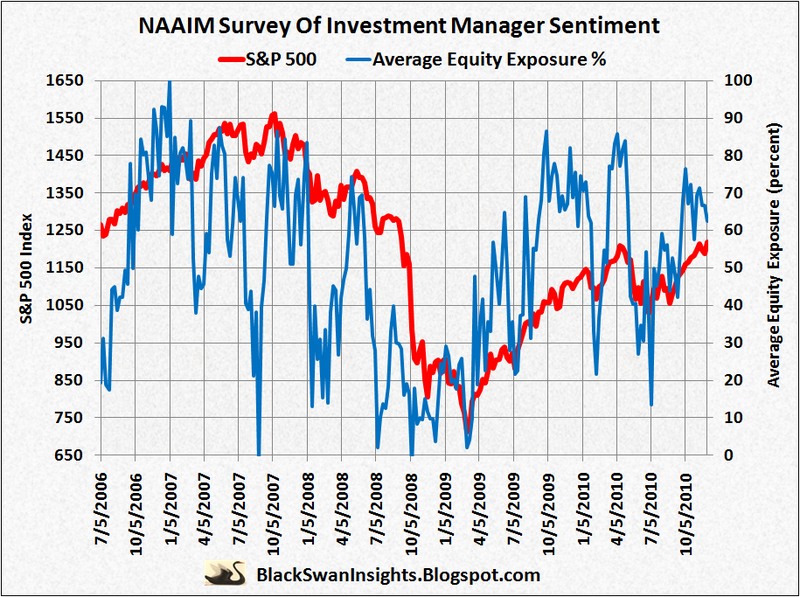 The NAAIM survey is a contrary indicator and market tops usually coincide with a reading around 80% and bottoms near 20%. I like to compare and contrast what the retail crowd is doing according to the AAII sentiment survey and the NAAIM which surveys the professionals. We see that even though the market has been strong, investment professionals are not increasing their equity exposure. They are still long equities but not to such an extreme that would signal a correction in the market, indicating the rally may continue. Meanwhile, the AAII sentiment is showing that the retailers are very bullish and expect higher prices.